I love food. I am a picky eater, just ask anyone, I can’t eat certain things but I LOVE food. It’s something that my family has shifted to revolve around. My mom cooks every meal, breakfast, lunch, and dinner, and most of our time is spent in the kitchen or dining room. It’s rare for our family to have the same meal in a month. I grew up on Julia Childs, Jacque Pepin, José Andrés, and Iron Chef. For each birthday, we get to choose the meal including how many courses, the drinks, and the dessert. For my thirteenth birthday, I had a 6 course dinner party for me and my friends, all different cuisine, all cooked by my mom. All of my love for food, cooking, and baking has come from my mom, she is the one who showed me that cooking isn’t scary it’s art. Through her I learned about cuisines from all around the world. I’ve learned to appreciate them all and so as the France trip came closer, my mom started making more and more French food to “prepare me” for what I was going to experience. There was lots of eggplant, zucchini, and tomato. I thought that I was going to have to refuse some of the food I would be given during the week in Vitre because those three foods are my very least favorite. However, once we got to France, I realized that the French cuisine I had grown up with was not the French cuisine that was in France. Dishes were still very rich and filling but they were also less intimidating. Yes, the food that we ate the week in Paris was very classically French, but it was also more relaxed than what my brain had told me to expect. There were things like escargot and moules frites, duck confit and foie gras, but there were also dishes like raviolis and steak. Things that anyone would enjoy, regardless if they have a pallet for French cuisine. I think part of why there was so many recognizable and familiar dishes on the menus was because there are many tourists in Paris, with many pallets, and some people possibly could find more quintessential French foods too sophisticated. In Vitre, it was completely different from Paris. On the first night with my host family, we had boiled pasta with hamburger steak. There was no salad and no sauces. At first, I thought that it was how they expected the American to eat but then, as the week continued, I realized that that’s just how they eat regularly. When the week started and we went to school with our host students, the meals were something I didn’t expect at all. 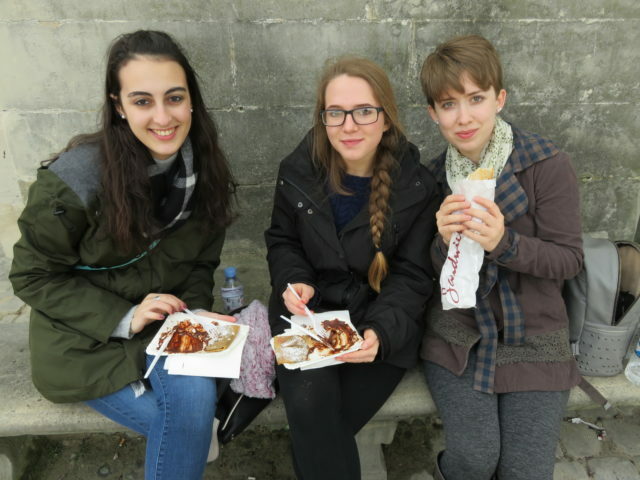 We had things like veal, tartiflette, and even profiteroles. Lunch was set up so you could help yourself to as much as you liked (within reason) and there were amazing million options. It was evident that not only did they value student’s nutrition and health, but they also understood that students are more likely to eat food if it tastes good. In my high school, there was pizza that tasted like cardboard, watery frozen milk, under-ripe oranges, and sometimes chips (but those cost extra). Every once in awhile we got mozzarella sticks or teriyaki chicken with brown rice. No one cared about what was being served and when you bought lunch, you were forced to get a fruit, an entree, and a drink. But if you wanted two pieces of fruit, it cost more. And if you weren’t very hungry, they didn’t care. It was odd seeing the quality and care be so high in France, and I know it made us all jealous.